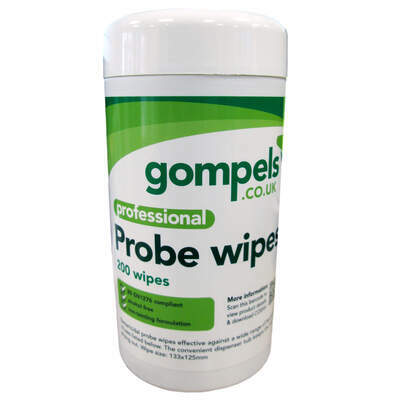 Keep work probes and thermometers protected from germs and reduce the risk of infection with our Gompels Probe Wipes. Packaged in an efficient and functional tub that easily dispenses when needed and holds a sizeable 200 wipes at any given time, this tub is ideal for storing in any medical or patient care facility for use when needed. Each of these probe wipes can be pulled out and wiped across the required surface to remove germs before additional use which works together with other hygiene practices to reduce infection.